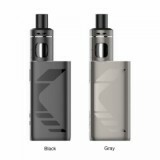 Kangertech Subox Mini V2 Starter Kit consists of built-in 2200mAh battery and 2ml SUBTANK MINI 2.0 tank. The two coils equipped will satisfy your different needs, you can choose 0.8 ohm NCOCC coil for half-DL vaping or a 1.5Ohm NCOCC coil for MTL vaping. Here comes the upgraded version of Kangertech SUBOX MINI Kit - Kangertech Subox Mini V2 Starter Kit, which consists of built-in 2200mAh battery and 2ml SUBTANK MINI 2.0 tank. Similar with SUBOX MINI, the Subox Mini V2 also features elegant design and light weight. The two coils equipped will satisfy your different needs, you can choose 0.8 ohm NCOCC coil for half-DL vaping or a 1.5Ohm NCOCC coil for MTL vaping. The SUBTANK MINI 2.0 tank adopts top filling design and top leak-proof airflow control, which can bring you a best vaping experience! Come and get one Kangertech Subox Mini V2 Kit and start to enjoy your Kangertech vaping. • Kangertech SUBTANK Mini 2.0 Tank and Replacement Coil are also available in BuyBest.